I had not even realised that my friend Hannah from Bittersweet had tagged me until I went to her site to get some links straight for our Traveling Egg Meme. The little eggs have left my house and are now on their way to....surprise! Anyway, as I am (im)patiently waiting for monday to post our last Daring Baker Challenge, and it is raining cats and dogs preventing me to take picture of B's killer birthday cake, I thought I would accept Hanna's tags and let you in on this new and fun meme. Cleaning my cubie at work without telling my area director. I was preparing myself to give my 2 weeks notice as manager of a gym, taking a pay cut and stopping the rollercoaster ride of membership sales and commissions. I wanted to go back to my first love, personal training. At the same time, I was receiving a phone call from a former chef I had worked with at a restaurant and he was asking me to come help him out with pastries and desserts. Finally I had found the perfect way to do two things I loved: 3 days baking, 3 days training. (I have had 6-7 days workweek for the past 10 years, I don't know what a complete weekend off means). 1. Make sure that my in-laws are provided for until they are no longer with us. 2. Re-buy my husband all his photo equipment including his favorite Hasselblad. His first job with his first wife was to be a photographer and though they liquidated the business when they divorced 20 years ago, I know he misses it terribly. 3. Take a 6 months vacation to visit all my relatives back home. 5. Partner up with a very talented baker I know in town and open shop. How much money were we talking about?...!!! 1. Staying up too late. I function very well on 5 hours of sleep, but I know that ultimately it’s not good for me. 2. Eating too fast. B. made me a queue card that he places next to my water at dinner: “slow down and chew”. Sorry, family habit. 3. Not having enough patience with my parents. Age makes me act better though. 4. Never screwing the tops or lids well enough on bottle, jars, boxes,…Ask Chef C. when an entire gallon of mango puree fell on his freshly starched uniform….delighted…never heard my name yelled so loud in my life! 5. 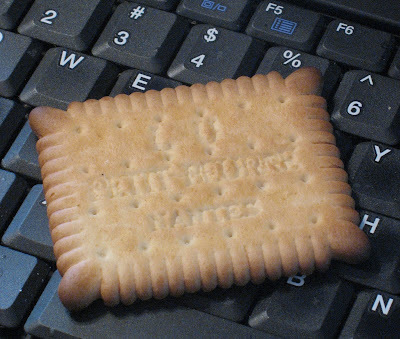 Eating while reading blogs…I end up with sticky keys and bad typos! 1. Baking. Whether for a customer or for us I MUST hold a whisk or a spatula at some point during the day. It is a no brainer for me, I just go ahead and do it. It is my element, the fuel that feeds my life. 2. Running and lifting weights. I hurt just about every disc in my spine lifting sacks of sugar and flour, pulling out sheet trays loaded with cake pans and ramequins. The doctor recommended weight lifting to strengthen my joints and bones and it really helped with the aches ad pains as well as the energy levels. Running allows me to clear my head, think about desserts I want to make and “line up” my schedule for the next day. 3.Crafting. I make my own greeting cards with collages, papers and decoupage. Decoupage on wood in another craft I love. From frames to boxes, if it is wood, it’s mine. 4.Reading books. I wish I had more time for it but I guess that’s what retirement is for! 5. Having diner with my husband. No TV, no radio. We just talk…We have very little time together, Sunday is “our” day even if we don’t do anything special so dinners are sacred. We light up a couple of candles, set the table and spend a good hour or more just connecting. 1. my green leprechaun looking boots from when I was 12…awful…. 2. Flat shoes. I need at least 3 inches or I feel like I stump like an elephant. 3. Large loop earrings….I got this close to having my ears lobes cut out by a baby pulling on my earrings while I was holding her. 4. Bright pink nail polish. 1. Stand Mixers. I have got 2 that are used everyday. 2. Camera. I just love playing with it and figuring out all its possibilities. 3. Laptop. Lisa likes to joke that it is hooked to my hip and she is not completely wrong. 4. My cross-stich. I know it’s more like a craft, but for me it is a toy. I play with it every other day. I am still working on the same project I have bee for the past 5 years, but playing with it relaxes me. 5. My fountain pen. I love writing…poems, lists, shorts, blurbs, diary, thoughts…I use it everyday. Cost 3 euros at Carrefour but I love the way it writes. I was trying to think of a more elusive or more creative title but I always have a difficult time doing so with desserts that incorporate several elements from others I have made or admired through pastry shops front windows (my favorite past-time), but sometimes you have to call a cat a cat. Note for the future: if you are good at it, you are hired the day I publish a book! The dessert came about when Mary from Alpineberry announced that "Tropical" would be this month Sugar High Friday theme. Every single month, no fail, I am stuck with the same problem: my thoughts start racing and it takes me forever to make up my mind. I never thought I would say this concerning desserts, but in this case abundance is not great! Most of the produce I find here is what I would consider tropical, with plenty of papayas, limes, kiwis of different kinds, cactus pears and so forth but for me the little French alien, I still consider them exotic in some sort of way. 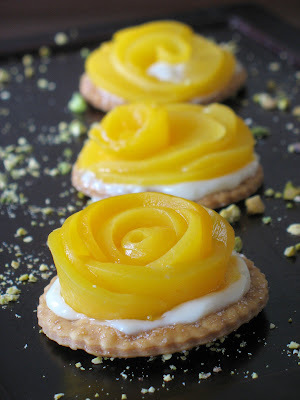 For the event I chose to focus on mangoes, pistachios and pineapple. 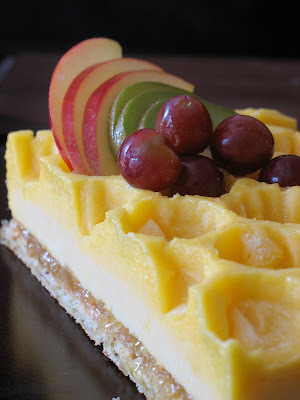 I knew I wanted a pistachio dacquoise at the base and a mango mousse on top, but that sounded kind of basic, so I added a layer of pinneapple preserve (store bought I confess) in between. I started to think about different design elements that would make it more interesting to the eye when I came to plate it for guests. At the restaurant I had those really nice flexible molds made specifically to give a form to a mousse or frozen custard. But I was at home, ready to get started on my dessert...and no desire to head downtown to borrow one (too hot outside!). I did not have those but I had a few sheets of large bubble wrap that would do the trick in a pinch. 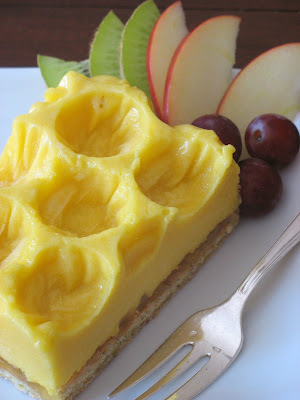 The honeycomb design echoes the honey in the mousse and creates little pockets very useful to prop up a few cut fresh fruit for plating and decorating. 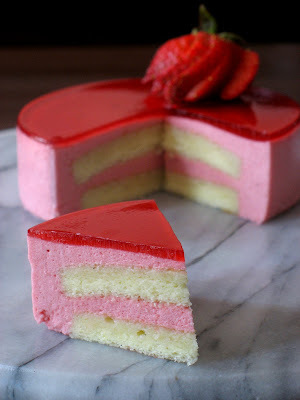 Dacquoise (dah-kwaz) refers to both the cake it is named after composed of layers of nut meringue and buttercream, as well as one of the layers of meringue. 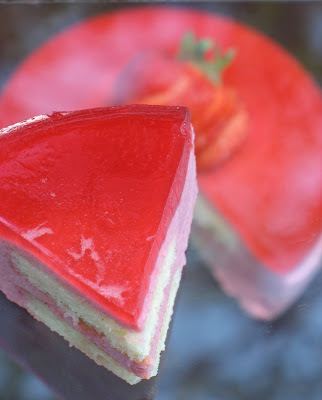 It is used at the base of many cakes in French pastries and provides a nice change from a pastry or shortbread crust. A dacquoise is very close in texture to a macaron, with some recipes adding a touch of flour or cornstarch to the batter. I already like a dessert where the base is a big giant layer of macaron and who better fitted to provide me with a great recipe than the master of macaron himself? My sugar daddy, Pierre Herme. The mousse is one that I developped over the years from different sources making it safe to adapt with all sorts of fruits. This time I replace some of the sugar with wildflower honey and added some freshly grated ginger to perk it up a bit. The dessert looks a lot more intricate than it is. 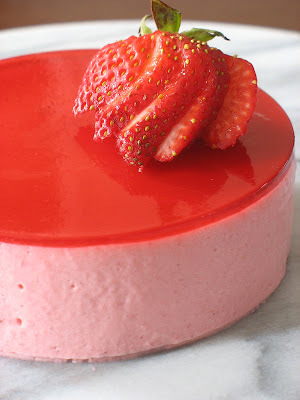 You can prepare the dacquoise a couple of days ahead, make the mousse and layer the rest of the dessert the day before you plan to serve it. In a large bowl, mix togther the nuts and powdered sugar. Beat the egg whites to soft peaks. Slowly incorporate the granulated sugar with the machine running, until you get nice glossy peaks. Delicately fold in the nut mixture. Spread on a parchment line 8x8 baking dish and bake at 340F for about 35 minutes. Sprinkle the gelatin over the water and let soften for about 10 minutes. 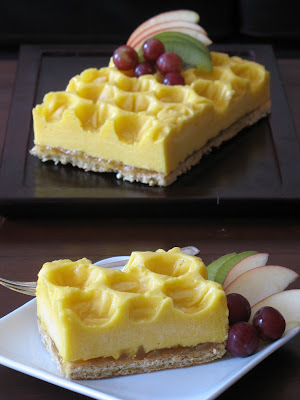 In a medium saucepan, combine the mango puree, sugar, ginger and honey. Heat until the sugar is dissolved. Remove from the heat and add the gelatin. Stir to dissolve and let cool to room temp, or until it starts to thicken a bit. Fold the whipped cream into the mango. Use it in the dessert assembly before it has time to thicken so it will be easier to pour. Remove the dacquoise from the baking pan. Line the same pan with heavy duty plastic wrap. Cut a sheet of bubble wrap to fit and put it on top of the plastic, bubbles side up. Pour the mango mousse and freeze until set. Spoon 1 cup pineapple preserves (or others of your choice) on top of the mango mousse. Press the sheet of dacquoise on top with a light pressure of your fingertips so all the elements adhere together. Freeze until ready to use. To unmold, flip the pan over and remove the plastic and bubble wrap. Decorate and serve. Under other circumstances I would have started this post with the title "Banana Crepes and Salted Butter Caramel Sauce", but Andrew wanted sauces to be the center of attention in this month "Waiter There Is Something In My..." so my favorite caramel sauce took center stage. There are very few things I love more than crepes in the desser category. Summer or winter I do not mind standing in front of the cooktop and flipping a batch. Oh yeah, I am a flipper! As soon as that crepe is pulling out from the side and loose from the bottom, I will flip it. There is enough batter for a couple to end up on the floor (makes the dog happy) or stuck to the ceiling (makes the husband worried). I like them sweet with a spritz of lemon juice and sugar or filled with my mother's strawberry jam. That's when I am being good....When I am being bad, I will load them up with Nutella, bananas, drizzle some caramel sauce, a good amount of whipped cream and some chopped nuts. Maybe just some chocolate, coconut sorbet and again that awesome sauce. Allright there is obviously something that I love as equally as my sweet crepes and it is that heavenly and damned salted butter caramel sauce. It is heaven on a spoon, soft and good, it is evil on your thighs, especially if you eat it at the rate we do! Try it once and there is no going back!! I noticed I always have jar of it in the fridge and it is one of the first things I put in goodie baskets for friends and family. It was not always so and I can't believe I have let such a long time pass by before making it! I was first introduced to it while reading one of my favorite blogs, Chocolate and Caetera. Guillemette makes the most tempting creations and when I read her post about the sauce, I was hooked. 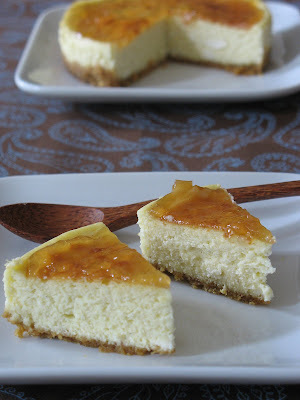 I am sure that caramel sauce also helped win HHDD #10 Cheesecakes. Now that everybody has been introduced, let's proceed with the fun. If you read French, head over to Marmiton where you will find the crepe recipe under (I translated) "the best crepe batter in the world". Now if you post such a title, you'd better have some back up or a strong faith in your recipe! Well....It became "the best" I had made so far after I added 1/2 cup light beer to the batter. See, to me there is no crepe without beer or cider. It helps the dough relax better, it helps it become airy and light without adding too much butter or oil to the batter. The banana filling pretty much came together as I was going along....can't mess up too much cooking nanners in butter, sugar and rum now can you?!! Once the crepes were flipped and filled I tied them up in little bundles with cut strings of licorice. The sauce served alongside really gave them another dimension. Can't you tell we enjoyed dessert that evening?! In a heavy saucepan set over low heat, combine the sugar and water and heat just until the sugar is dissolved. Add the butter. Let it come to a boil and cook until it reaches a golden caramel color. Remove from the heat and add the cream ( it will splatter and get crazy, but do not fear and trust the recipe). Whisk to combine and put back on the stove. Let it come to a boil again over low heat and cook 10-15 minutes until you reach a nice creamy consistency. Pour into a jar and try to refrain yourself from drinking it! In a blender or food processor, combine all the igredients and pulse until fully incorporated and no lumps remain. If you decide to do it by hand: combine the flour and salt in a bowl. Make a well in the center and add the eggs, oil and a little bit of milk. Work the batter with a whisk, and slowly add the remaining milk, until the batter comes together and the lumps disappear. Add the beer. No matter what method you used, strain the batter if necessary. Refrigerate, covered for an hour. In a saute pan set over medium high heat, laddle 1/4 -1/3 cup batter (depending on the size of your pan) and cook 1-2 minutes on each side. Cut 4 bananas into thin slices. In a pan, melt 4 Tb sugar with 4 TB butter, add 1/4 cup rum and cook until the sugar is melted. Add the bananas and cook them until soft. Remove them fom the pan. Let cool. Melt 1/2 cup of dark chocolate with 1/4 cup heavy cream in the microwave. Fill each crepe with about 2 Tb. melted chocolate and 14 cup bananas. Gather the edges of the crepe together and tie up with a string of licorice. Serve with plenty of caramel sauce. One night that I was reading a post by my favorite Cream Puff about a beautiful dessert called Lucia's Walnut Cake. Her post was a beautiful tribute to her grandmother as well as an introduction to a soon to be published cookbook, Adventures of an Italian Food Lover, by Faith Heller Willinger. Cath from A Blithe Palate had been given the opportunity to get a first look at the book before its release and had contacted Ivonne about it. 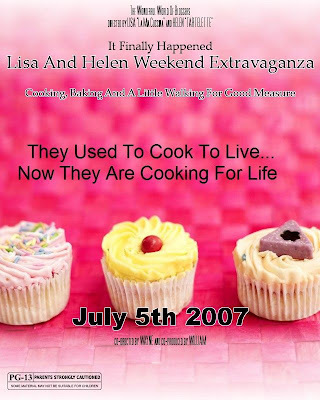 Together they decided to create a blogging event of some sort around its release, sending copies to other bloggers with the sole instruction to make something from it and share their experience in a post, no book reviews necessary. I so wanted to be in the loop that I visited Cath's site, left her a comment ( Did I beg? maybe...!) and a couple of weeks later I was sitting down on the back porch with an espresso and my own copy of the book. This book represents everything cooking and baking is for me and my family. There is not a dish I make that does not have a story, a person or a name behind it. Some of the dishes I cook revolve around family holidays or special events, some remind me of the people who crossed my path and made me the person and baker I am today. Faith Willinger has the same approach in this book. All the recipes invite you to in somebody's home, life and cooking. Little of the foods I make are Italian per se but they bear similarities having lived a good part of my life so close to the area, and I was very excited with the ability and ease this book provided me to broaden my horizons. Out of all the recipes in the book, my thoughts came coming back to the Amaretti one. 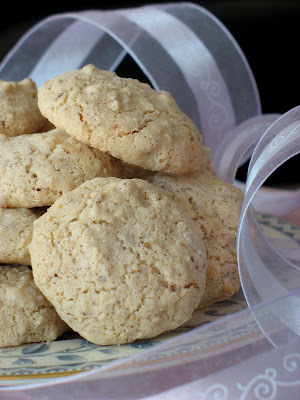 I have always admired this delicate cookie and yet, I probably only had it a couple of times in my life.Amaretti are cousins to the macarons in a way: same ingredients, different baking method and no filling. Their white and delicate appearance makes me think of weddings and summer days, long strolls on the beach and fragrant coffee. What can I say...I am a romantic. 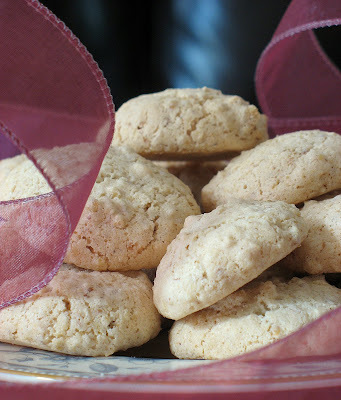 The first time I had an Amaretti was during a memorable trip with my parents to Turino. Twenty eight years ago, my parents and grandparents bought a chalet in the southern Alps, a stone throw away from Italy. We would go across the border and get pancetta, coppa, pannetone, grappa and sometimes we would stay for lunch. On one occasion, over 20 years ago, we decided to have lunch at a tiny restaurant with one large dining area painted with a beautiful fresca of Italian coutrysides. It was late already, middle of the summer, hot outside. The chef was on his own, his aides and waiters gone on their daily siesta. We were starving, but well behaved, the chef was making everything from scratch, and plates were coming out one at a time. Our meal was a feast of ravioli, cold cuts, pizza, fish and other delicacies. We decided to make good fortune and the four of us shared each plate that was coming out of the kitchen when it was coming out. We slowed down after the first bites of ravioli filled our tummies with warm rich and cheesey tomato sauce. I don't think my memories are failing me when I say that I truly believe we had the greatest time as a family that afternoon. The chef was kind and loved the way our little group chatted and feasted. Towards the end, we motionned for him to take a seat with us but he said he could not, he wanted to do the dishes and clean up before the Mrs. would come in and give him a hard time for serving "after hours"! He brought my parents espressos, spearmint syrup and water for us and a plate of amaretti. My first ones! I hesitated as they looked so delicate. My brother ignored his for a while...long enough for me to eat mine and half of his plate! I asked the chef how he made them and he said "I don't make them, my mother does and she only told me the ingredients"....well, come on man! Dish it out!!! He hesitated for a second, then he replied "ok, well, it's almonds, sugar, egg whites and a pinch of salt" That was it?! It took me all this time and this book to finally make them. I don't know the name of the restaurant that day many moons ago, and I surely do not know the name of the man who cooked us that fabulous meal, but the cookies were just as I remembered. Crisp and delicate, perfect with coffee or mint tea. Thank you Ivonne and Cath for the opportunity. There are many pages of the book already bookmarked and other recipes already tried like the olive oil brownies that are out of this world. If you would like the recipe for the amaretti, contact me via email(marinette1ATcomcastDOTnet) and I'll be happy to send it to you. About a month ago, I started a funny email exchange with Hannah of Bittersweet. 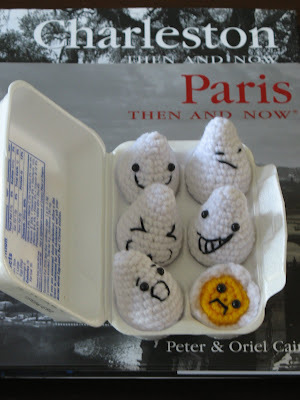 I left a comment on her blog after seeing the cutest box of eggs…Eh? Allright, Tartelette has gone off the deep end…now she gets all excited “looking” at eggs. Hear me out: Hannah makes the most precious crochet items (seriously girl, set up shop already!! ), and once my eyes settled on these I started to covet them (familiar Lis?!). I even entertained the idea of learning how to crochet so I could duplicate them, or bribe my mom to teach me or make them for me. A few days later I received an email from Hannah, offering to make another carton for me for a bargain or a swap. I think they are priceless, but we agreed on swaping the eggs for a few jars of homemade preserves. I was so excited to get Hanah’s packagage! The eggs look so much cuter in person than through the monitor. Such talent…and they are funny….but there started my “problem”. Once I had the box in my hands, I was not sure where to display it. The kitchen? It would get dirty. The window sill? Not enough of a showcase. The dining room or living room? Neither are really a good spot but the eggs would be a good conversation piece or ice breaker, and yet they were still out of place. I was holding the box in my hands thinking: “Now what?” I was getting ready to go visit Lisa in Ohio and thought they would make a nice present. But then, same thing would happen again: she’ll admire them, look at them and then say “Now what?” That’s when the solution to the whole thing came to my mind: these eggs need to see the world, they have the traveling bug! Lisa and I did not have our stuff together yet to send them off on their merry little way, so they came back to South Carolina with me…and now they are off to greener pasture! 1/ When you unpack them, enjoy them or a few days. Sign your name or your blog name on the carton (anywhere). If by the time the eggs reach you, the carton is full of names, sign on a small card and put it inside the box. 2/ Take a picture of the eggs with you or something representing your blog, city or state, and write a short post including that picture and a link back to Hannah’s and Tartelette’s blogs. 3/ Send them to somebody with a food related blog, but do not reveal their identity. Include the enclosed card with a permalink to this post in case more info are necessary. If you do not know an address, ask around, beg, plea or lie! There are a lot of packages being exchanged between us these days so I have no fear the eggs will find a temporary home! 4/ If for any reason you do not wish to participate, email Tartelette (marinette1ATcomcastDOTnet) to send them back to her so she can set them off somewhere again. B. and I celebrated our ninth year anniversary July 11....well, when I say celebrated it's not exactly true. Oh yes, there were cards and smoochies, but he left flowers in the car that night not expecting temperatures in the high 80s by six o'clock in the morning. He woke me up with a bunch of pretty but yet wilted flowers, that was comical and it reminded of the way I felt on my wedding day...wilting and melting back in 1998 under the hot sun of Charleston. I am surprised that nobody back then tried to dissuade me from a July wedding. What was I thinking? Well, I had no idea it was going to be over 100F that day, much like our anniversary day last week. Anyway, back to our celebration. We both worked late night so we decided to stay home, grill some seafood, drink some Champagne and relax on the porch. We were so tired that we barely drank one glass each and crashed into bed. Oops! We felt a little strange the day after: should we have made more of a production out of it? Should we make up for it and go out somewhere fancy? Any of our friends would tell you that it would not be like us. We do things everyday to show our love and respect for each other. They are not grand gestures but they truly come from the heart. Oh sure, I am not going to play it all cool, we do have fancier celebrations but I'd choose a picnic on the beach under a full moon over a formal restaurant dining room. Those evenings are usually spent with my parents when they come visit. Going out with them is a rare treat so then we make a big deal out of it, plus ordering with my dad around is an adventure in itself (I'd better savethat for another post). What about the Champagne Sorbet? (good you're still reading) Well, we had most of the bottle left and still some fizz in it but no real urge or desire to drink it right away. What to do? Cocktails, vinegars, sauces,....Sorbet!!! Since it was still scorching hot outside I figured it would be a great way to end dinner that night. 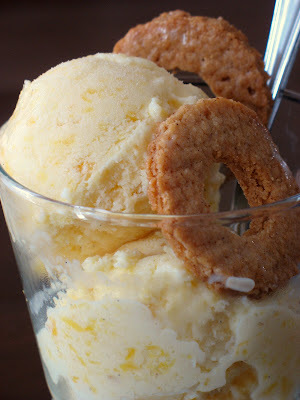 The recipe could not be any simpler and if you do not have an ice cream maker, do not worry. 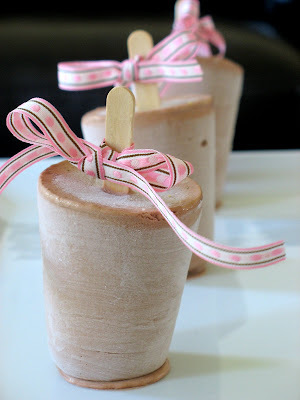 Once you are ready to freeze the sorbet mixture, pour it into a glass container and freeze for a couple of hours. With an handheld immersion blender, Kitchen Aid or hand mixer, whisk the dough for a miute or so. Return the dish to the freezer and repeat a couple more times. Et Voila! Bring the water to a boil and stir in the sugar, stirring until the sugar is completely dissolved. Stir in the champagne and lemon juice. Process in your ice cream machine following the manufacturer's instructions or use the method described above. My friend C. has her in-laws visiting and they love cheesecakes and she loves mini-everything. 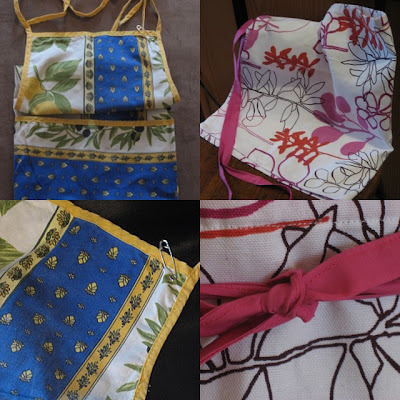 She has a whole array of molds, pans, serving dishes ready to satisfy the most avid baker and yet, she hates anything that has to do with putting on an apron and spending time in the kitchen. She usually calls me to the rescue and I always love to oblige. A visit to her house is always a treat as she is the most perfect host, Martha has nothing on her, believe me, and I spend quite a bit of time admiring her designer's eye an skills at the same time I deliver my baked goods. Her requests for the cheesecake flavors were minimal: light an airy, no chocolate, maybe some citrus...needs to go well with vodka cocktails an margaritas....Hmmm...I think I can manage that! I did not have to look deep into the pantry or the fridge for what I wanted the cheesecakes to be. While visiting Lisa a couple of weeks ago, I begged her to take me to Trader Joes (why we don't have one here is beyond my understanding!) and picked up a jar of their ginger spread (like a thick ginger jam) as well as a jar of Yuzu marmelade. After a successful first run with Yuzu curd, I knew C. would love a thin glaze of the marmelade on the cheesecakes. I made a couple of extras the day before her dinner so that we could try them out....you know...for safety purposes!!! Before I could get my spoon into one of them, she had already made her way through 3/4 of it, so I packed one up to share with B. later on. Well, later on was last night and he went to bed as soon as he got home from a music gig. I, on the other hand was all revved up from chatting with a friend....And why oh why was this cheesecake strategically positioned in the fridge that everytime I'd open the door for water, there it was, sending me subliminal messages. After a 30 minutes dance between my fork and the water, the fork won and I sat outside with half of it. Needless to say, I fell asleep like a baby!!! 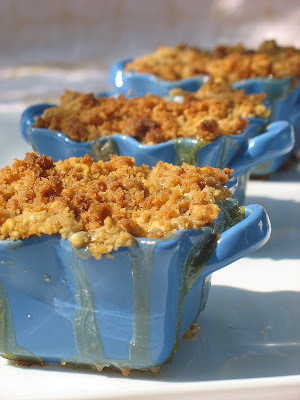 In a medium side bowl, combine the graham cracker crumbs and the melted butter. Divide among 2 4 1/2 inch mini springform pans and pat with your fingers until evenly distributed. Bake 10 minutes. Lower temperature to 325. In a large bowl, with the electric mixer or by hand , mix the cream cheese, butter and sugar. Add the eggs, one at a time until well incorporated. Add the vanilla and ginger spread. Divide betwee the springform pans. Wrap each pan with heavy duty foil. Set them in a roasting pan, fill with water and bake at 325 for about 40 minutes, or until they wiggle just a tiny bit in the middle. They will set more after an overnight trip in the fridge. Remove the foil, let cool, and refrigerate. When ready to serve, run a hot knife on the inside of the pan and release the cheesecakes. Heat up the marmelade in the microwave until of spreadable consistency and spoon on top of each cake....you are ready to go! Late last night Old Chef called me and "wondered" if I could make 50 apricot tartlets "on the fly" (last minute/quickly) for a function thursday night. I put the verb wonder in between quotes because this man never just "wonders". When you pick up the phone, he is on the other end trying to make sense of his crazy ideas before you even can say "hello". Nothing crazy or out of the ordinary with his request this time, and as usual he was leaving me with most of the execution choice, flavor, plating, etc... However....I had told him how I showed Lisa the rose fruit trick last weekend and he mentionned I could make them pretty like that for the function. Oy! Ok...I am extremely patient (Lis?) and the thought of 50 pretty apricot roses did not phase me much. What bothered me was finding decent apricot that I could poach and slice to make them. I had to supplement my batch with jarred ones, got home and got cranking. In the middle of my stirring the pastry cream (my question at the time was "which alcohol should I flavor it with this time"...see! I wish I had more days like that), Old Chef calls. Change of plans. We are now at 100 tartlets and no more apricot but they want peaches. Oy again! Talk about trying to be cost effective....back to the store, back to see Charlie and his homemade jarred fruits and now the fun an resume. I was still pondering that alcohol issue, in case you were wondering...and in the end I opted for spiced rum because nothing else floated my boat and I was trying to be a little cost effective with what I had. The tartlets are easy to put togehter and if you do not have the patience to play around witth making the roses, just place them on the pastry cream, in a spiral pattern. I downscaled the recipe for home use as I doubt that no matter how pretty or good they turn out that you want to be stuck with 100!! Place flour and sugar in the bowl of a food processor, and process for a few seconds. Add butter, and process until the mixture resembles coarse crumbs. Add the ice water then the egg yolk, processing just until the dough holds together. Do not process for more than 30 seconds. Turn the dough out onto a work surface. Place on a sheet of plastic wrap. Flatten, and form into a disc. Wrap, and refrigerate at least 1 hour before using. Roll the dough out thin and with a 3 inch cookie cutter, cut as may rounds as needed. Lay them on a parchement lined baking sheet. Sprinkle with 1 TB. sugar and bake at 350F until golden brown and cooked through. In a medium bowl, whisk the sugar and egg yolks together, add the cornstarch mixing until you get a smooth paste. Set aside. Meanwhile in a saucepan combine the milk and vanilla bean on medium heat until boiling. Remove from heat and add slowly to egg mixture, whisking constantly to prevent curdling, (pour through a strainer if this happens) Remove vanilla bean. Place the egg mixture back into a medium saucepan and cook over medium heat until boiling, whisking constantly. When it boils, whisk mixture constantly for another 30 - 60 seconds until it becomes very thick and it is hard to stir. Use ripe fruits, canned fruits or poached fruits. To make the roses, cut thin slices of fruit. For the bud, choose a small piece and roll it between your fingers. Let rest on flat surface and start adding slightly bigger fruit slices around it, overlapping a little. Before you know it, you will have a pretty fruit flower, and remember that practice makes perfect. News flash…the heat is scorching here down south….My solution? Something frozen, quick and satisfying. When I got off the plane yesterday, I felt I was wilting on the spot. I had easily forgotten that with heat comes high humidity here in Charleston. I kid you not, my pants were wrinkle free in no time flat and my energy level sucked out of my body. I had not realized how my long weekend away had left me somewhat tired and I ended sleeping most of the time on the airplane, and that meant I was wide awake at midnight. I started looking around the kitchen, wanting to bake something to calm me down (works as good as drinking hot milk sometimes). Five days without his mate and B. had left quite a few bananas to go past their prime. I thought about muffins, scones or cake for breakfast the next day but that meant turning the oven on and oh..did I mention how hot and humid it was? Yes, bad idea…That’s how I ended up making a frozen parfait, on the complete opposite end of the spectrum! In an electric mixer bowl, whisk the egg yolks and 1/4 cup of sugar until pale and fluffy. In a separate bowl, stir the banana puree and mascarpone until smooth. Fold the yolk mixture into the banana mixture. Whisk the egg whites until firm peaks. Add the remaining 1/4 cup of sugar, 1 Tb. at a time and continue to whip until glossy. Fold the whites into the banana mixture. Whip the cream to soft peaks and add to the banana mix. Line the inside of a narow loaf pan with plastic wrap and let it hangs over the sides. Pour half of the banana parfait in the mold. 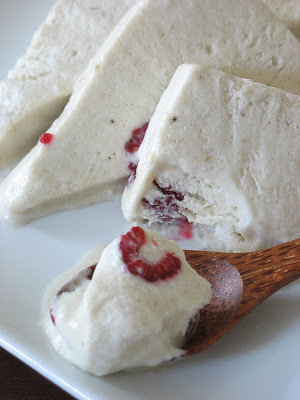 Scatter raspberries on top and add the remaining half of the banana mixture. Cover with plastic wrap and freeze until firm. Cut out slices and plate. A while back, Gilly from Humble Pie was interviewed as part of an game going arond food bloggers (and others I am sure). The end of the interview gave instructions for anybody to ask to be interviewed also. I hesitated for a while and then I took the plunge and asked her to send me my five questions. So here it is! I hesitates because some are very personal, but in the end I kept some details for my closest friends and my own private garden, but in the end this is it in a nutshell. France? Do you travel back to France very often?Let’s try to make a long story short. I came to Charleston, South Carolina August 1996 to do my Masters degree in American/English History. My major back in France was English, which did not mean we learn English, but that we learn everything history/arts/literature related in English relating to both American and British civilization. I was taking classes here at the College of Charleston, I was also teaching French conversation and doing my research. I found a 4th occupation thanks to my very cool roommate: college socializing…something that we do very differently in France. Local bands and local venues soon had no mystery to me…a wonder I passed m thesis with honors! I don’t go home as often as I wish. Since I have been here I only went back 4 times on vacation and twice for funerals. I wish I could go home more often, especially now that I have come to know my nieces, that my grandfather is going to be 98. I am very lucky that my parents come once a year and spend one month with us. was your favourite part of the whole process? What did you like the least? Would you ever do it again?There are two things that I really liked about the process. One was looking at the lot, the blueprints, looking how the land and house would become one. Looking at the house plans and trying to grasp the coming months was like inhaling adrenaline. The other favorite thing was working alongside my husband painting the house in over 100F heat “honey, is it a problem if my sweat dripped in the paint bucket” “Keep going”, or putting the hardwood floors until 3 or 4 in the morning. It took us 15 months winter and summer, but we have learned so much about each other and our couple. When I was saying that we did over 75% of the work ourselves, I was not kidding…and that’s where the least favorite part come into play: I did not enjoy seeing my man suspended on a 2x2 putting up sheetrock or nailing tiles on the roof. Would we do it again? Yes! Actually my husband still does…being a foreman for the neighbors who operate a building company and who admired his work…on top of his “real” job. 3) How did you and your husband meet?We met on May 17th 1997 during a History conference held at the College Of Charleston. It was a Franco-American conerence on the fate of the Huguenots in America and I was working as an intermediate/translator/ receptionist between the French guests and their American counterparts. My husband was not working a a professor then (sabbatical) and came the very last day to listen to the lectures and attend the gala dinner. When he checked in, I was so tired after days of high maintenance published authors that I clearly remember not lifting my head when he approached the reception desk to pick up his lecture material and dinner ticket. Then he spoke, and I slowly raised my eyes…the volice clearly matched the sexiness of the man it belonged to…and as they say the rest is history. 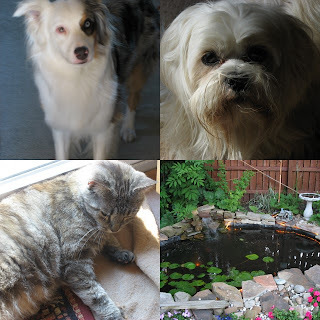 Ok…ok…a little bit more: we spend some time chatting that day. We sat down at dinner together and when another professor asked about my ongoing history research I felt like telling him to get a life, please can’t you talk about something else?!! So I turned to B. and said “pinch me and save me now”…and he intervened with a good joke. He drove me home and when we realized we were 19 years apart, well things cooled down a little…no kiss goodnight…The next day there was a big card on my doorstep, telling me that we did not chose to be born when we were that the distance between France and America is only what we make it to be and that he had fallen in love with me at first sight. That’s what happened kids, no lie. We knew the moment our eyes met, it felt like being home again. and why? Your least favourite item, and why?First of, I still work as a pastry chef but on a freelance basis: friends in other restaurant who need a hand one weekend they want to take off, helping old chef on his catered parties, word of mouth orders and parties. When I was full time at the restaurant, my least item to make was crème brulee…The owner of the restaurant hates flavored crème brules, so when it was all the rage to infuse the batter with extracts, flowers, herbs,…I was stuck to the vanilla one. Don’t get me wrong, there is absolute beauty in vanilla specked crème brulee, but the magic disappears fast when you make 100 a day..it was our best sellers. My favorie : the “special”. I was responsible for a menu of 14 items plus one daily special, and I had complete free range of what I could make…oh freedom! I could finally showcase my skills, love for one particular product, technique or play with some new tools, take full advantage of “no restriction”. I know it does not help much but it could have been a simple molten chocolate cake to a more complicated sugar basket filled with sorbets or fruits, a plate of petit fours, an assortment of molded chocolate truffles, anything. 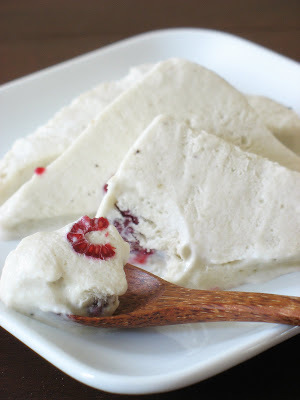 Out of the menu, my favorite to make was the “nougat glace”. It always reminded me of home, my grandma was from Montelimar, the nougat town and that turned into an ice cream served with raspberry sauce, that thing is a killer! about one food you like that most others seem to dislike? I love organ meat: sweetbread, tripes, kidneys,blood sausage especially…I don’t make them but once a month B. needs to watch his cholesterol and they are rather on the pricey side. Everytime I go home, I ask mom for blood sausage and kidneys. At a restaurant I always steer toward the sweetbread app… I guess I'll never be a vegetarian, sorry folks! asking personal questions! Please make sure I have your email address. 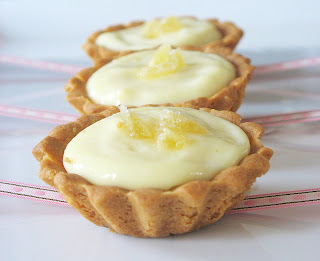 Click here for the recipe for the Lemon Tartelettes you see in the picture. Yes folks....I am leaving today to spend 5 days with Lisa from La Mia Cucina. We plan to trade Italian recipes and secrets for French ones, walking the markets and relaxing our tired feet. Not sure how much I'll be around, but I 'll try to post some of our creations and disasters (I hope not!) if we have time...we might be way too busy chatting and eating! 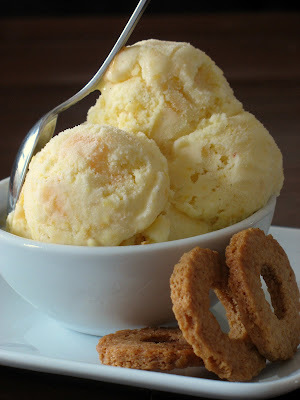 You know that Georgia Peach Ice Cream I was tempting you with the other day?....Well, it goes really well with a warm nectarine and banana crumble! Sounds like an awkward combination but I am telling you, it works! I have to add that we have eaten this with pretty much any kind of ice cream, from peach, banana, vanilla to chocolate and my favorite was salted butter caramel, but that will be for another post...if I can save enough for a picture! 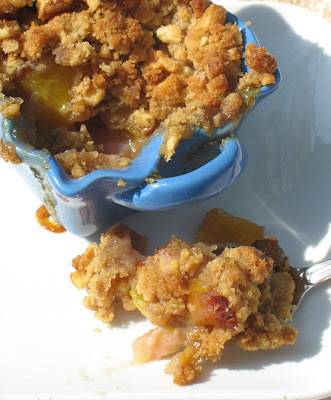 I know a crumble is not a typical summer dessert but my friends in the Southern hemisphere might appreciate a little comfort food. The rest of us can have a perfect excuse to dish out more ice cream just to cool things off! The beauty of a crumble or a crisp is that you can change and substitute the fruits at will, and play with the topping ingredients. I chose walnuts in the streusel topping, but I also think that coconut or almonds would work quite well. For the filling: in a large mixing bowl, combine the fruits and the rest of the ingredients. Toss well, but gently not to break the bananas too much. Divide between 4 ramequins, place the ramequins on a baking sheet as the fruits are most likely to release their juice, causing a spill. Set them aside while your prepare the topping. For the topping: In a bowl, combine the flour, sugar, walnuts, add the butter cut in small pieces and mix with your fingertips until you get coarse crumbs. Divide evenly among the 4 dishes. Bake at 350 until for 20-30 minutes. Update: It looks like the good folks of Blogger have named me "Blog Of Note". I am sincerely touched and for all new readers, well, I hope you hang around a little and get your virtual fill of sweets and sugar! Thanks for visiting! 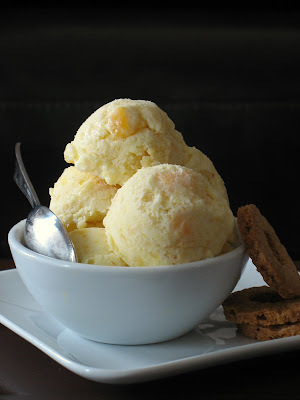 Yes, I know that me and the boys from the band were not talking about the same kind of peaches, but I could not help myself and kept humming the tune while peeling the fruit to make this ice cream. When I got to the farmer's market this morning and found a bounty of gloriously fragrant and yellow Georgia peaches, I knew some would end up in a cake, some cut up on my salad and some would turn out into an ice cream. It has been so hot and humid the past few days, we keep filling up on frozen fruits and icy cold smoothies while the ice cream machine is dying from boredom. I just was not that inspired until this morning. Oh sure, I could whip up some of our favorites again, but we are craving light, fresh and if possible incredibly tasty and there is nothing fitting the description better than a Georgia peach. There is not much to add, other than giving you the recipe, and urging you to make it with fresh fruit and not frozen or canned are we are here in the US in full peach season. The base is a light custard and a little lemon juice or crystallized ginger can really perk it up. Macerate the peaches with the lemon juice in a saucepan with the lemon juice and sugar for about 10 minutes or until syrupy. Simmer over medium heat until the peaches are soft for about 5 minutes. Let cool completely. Whisk the egg yolks with the sugar until thick and pale. In the meantime, heat the milk, cream and vanilla bean until steam rises. Gradually add the hot cream to the egg yolks, whisking constantly to prevent them from scrambling. Pour the mixture back into the saucepan and cook over medium heat until the cream coats the back of a spoon, 5 to 8 minutes. Strain the cream and let cool completely. Stir in the peaches. At that point I used an hand-held mixer to puree some of the peaches and leave chunks into the base. Churn the mixture in an ice cream maer according to manufacturer's instructions. Transfer to a container and freeze until firm. It is so good that I am taking it to Meeta's Monthly Mingle. She is on a well deserved vacation, so check back after the 7th of July for a cold and creamy ice cream round-up.